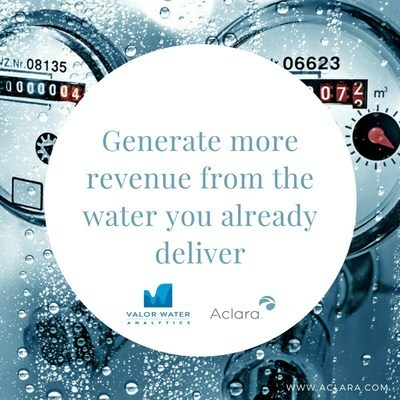 ST. LOUIS, June 6, 2017 /PRNewswire/ -- Aclara, a leader in smart infrastructure solutions to electric, water and gas utilities, and Valor Water Analytics, a developer of advanced meters analytics for water utilities, announce the formation of a strategic alliance to help water utilities reduce non-revenue water losses by analyzing data collected by advanced metering infrastructure (AMI) systems. Valor's solutions specifically improve water utility operations by locating sources of unbilled water. These apparent water losses include billing irregularities, meter-read errors, meter tampering, meter inaccuracy, meter right-sizing and meter misclassifications. Valor's machine learning and artificial intelligence methodologies are especially useful in recovering hidden revenue by pinpointing broken meters that are not registering correctly. These are almost impossible to locate without trend-spotting analysis that differentiates between behavioral change and mechanical decay. "The alliance between Aclara and Valor will allow utilities to make analytics an integral part of their AMI strategies for boosting revenues and reducing water losses," said Allan Connolly, president and CEO of Aclara. "Our relationship with Valor also supports our goal to become the leading end-to-end provider of smart infrastructure solutions to utilities." "By using analytics to identify apparent water losses utilities will get more value out of the data collected through their AMI systems, providing actionable intelligence to drive revenue, operational efficiencies and customer satisfaction, while minimizing risks and increasing financial resilience," said Dr. Christine Boyle, founder, and CEO of Valor Water Analytics. In addition to identifying apparent water losses, Valor's analytics solutions can help utilities improve customer satisfaction by identifying customer usage patterns that might lead to non-payment, allowing utilities to develop proactive strategies to avoid cutoffs. For more information, read our blog post, "The Skinny on Curbing Apparent Water Loss." Aclara Technologies is a world-class supplier of smart infrastructure solutions (SIS) to more than 800 water, gas, and electric utilities globally. Aclara SIS offerings include smart meters and other field devices, advanced metering infrastructure and software and services that enable utilities to predict and respond to conditions, leverage their distribution networks effectively and engage with their customers. Aclara recently won a Frost & Sullivan Global Smart Energy Networks Enabling Technology Leadership Award, was named a finalist in three categories of the Platts Global Energy Awards and was listed on Government Technology's GovTech 100 list of companies that sell to state and local governments. Aclara is owned by an affiliate of Sun Capital Partners. Visit us at Aclara.com, follow us on Twitter @AclaraSolutions or read our blog. Valor Water Analytics develops customer sales monitoring tools allowing utilities to track and measure their utility's revenue, customer behaviors, and affordability through a set of propriety analytics. The Valor Water Utility Solution integrates each utility's own data into a web-based tool as every utility has unique customers and policies. This set of solutions was developed by Dr. Boyle while at the University of North Carolina's Environmental Finance Center. Valor Water Analytics, Inc. is a woman-owned business.